Johannesburg, Republic of South Africa: Perskor, for the Publications Division of the South African Department of Information 16 pp. nd: 1976 or '77. General creasing and rubbing, else very good. Edited by John Steyn and designed by Attie Driessen. A propaganda response to the riots for distribution in the United States. Many photos, the Black-controlled bank, the local writer/philospher/witch doctor, cheese and wine parties have become the 'in thing', suits are in . . . beads skins and gaily-patterned robes are a thing of the past, 'unlike Harlem . 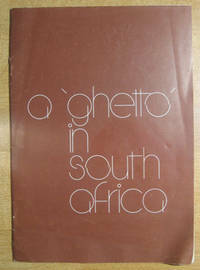 . . there are no high-rise apartment blocks in Soweto' and many more bon mots. 'In the United States of America this material is filed with the Department of Justice where the required registration statement, in terms of the Foreign Agents Registration Act of the Republic of South Africa Government Information Service . . . is available for inspection. This does not indicate approval of this material by the United States Government.' --from the collophon.. Good. 8vo - over 7¾" - 9¾" tall. 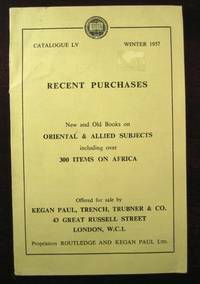 London: Kegan Paul, Trench, Trubner & Co., 1953. 76 pp. 1223 items. Contents: I. General and Miscellaneous Works; II. Near East: Ancient Civilisations; III. Near East: Medieval and Modern Civilations; IV. The Middle East: Persia, Afganistan, Caucasus, Western Turkestan, etc. ; V. India, Burma, Ceylon; VI. South-East Asia: Malaya, Indonesia, Siam, Indo-China; VII. China, Manchuria, Korea; VIII. Central and N. E. Asia; IX. Japan, Formosa; X. Africa; XI. Autralasia, Melanesia, Oceania; XII. Oriental Religions and Philosophy; XIII. Anthropology, Ethnology, Sociology, Archaeology, Pre-History; XIV. Oriental Languages and Literature; XV Numismatics; Addenda--New and Forthcoming Books. . Wraps. Good. 8vo - over 7¾" - 9¾" tall. London: Kegan Paul, Trench, Trubner & Co., 1957. 80 pp. 1601 items. Contents: I. Periodicals; II. General and Miscellaneous Works, Archaeology; III. The Ancient East: Egypt, Babylonia, etc. IV. Near East: Medieval and Modern Civilisations V. The Middle East: Persia, Afganistan, Caucasus, Western Turkestan, etc. ; VI. India, Burma, Ceylon; VII. South-East Asia: Malaya, Indonesia, Siam, Indo-China; VIII. China, Manchuria, Korea; IX. Central and N. E. Asia; X. Japan; XI. Africa; XII. 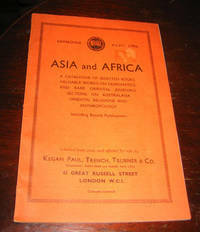 Australasia, Melanesia, Oceania; XIII. Oriental Religions and Philosophy; XIV. Anthropology, Ethnology, Sociology, Archaeology, Pre-History; XV. 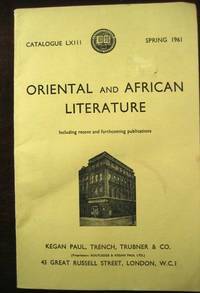 Oriental Languages and Literature; Addenda.. Wraps. Good. 8vo - over 7¾" - 9¾" tall.